The channel K Concert 88 Camera Combo UHF Wireless System from Samson features a 300' wireless range and 16 selectable frequencies for interference-free operation. It can be used to capture audio for recorders, HD camcorders, and DSLR cameras. 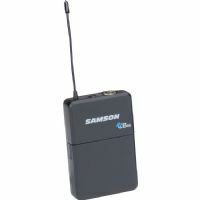 The Concert 88 UHF Wireless Beltpack Transmitter from Samson is a replacement transmitter for the Samson Concert 88 / 288 wireless microphone systems. 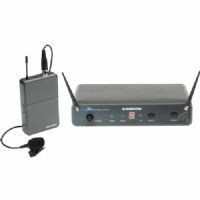 The channel K Concert 88 Camera UHF Wireless Lavalier Mic System from Samson features a 300' wireless range and 16 selectable frequencies for interference-free operation. The Concert 88 Guitar 16-Channel True Diversity UHF Wireless System from Samson consists of a CR88 half-rack UHF receiver, a CB88 bodypack transmitter, and a GC32 guitar/instrument cable. 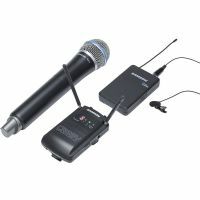 The Concert 88 Handheld 16-Channel True Diversity UHF Wireless System from Samson consists of a CR88 half-rack UHF receiver and a CH88 handheld transmitter with Q6 dynamic microphone capsule. 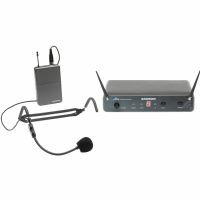 The Concert 88 Fitness System with Headset Microphone from Samson includes the CR88 diversity UHF receiver, the CB88 beltpack transmitter and the HS5 Headset Microphone. 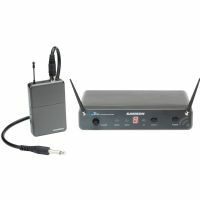 The Concert 88 Lavalier UHF Wireless Microphone Presentation System from Samson consists of a CR88 half-rack UHF receiver, a CB88 bodypack transmitter, and an LM5 lavalier microphone with clip. 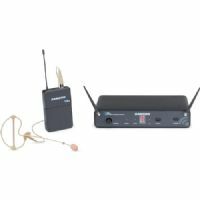 The Concert 88 Earset, 16-Channel True Diversity UHF Wireless System from Samson consists of a CR88 half-rack UHF receiver, a CB88 bodypack transmitter, and an SE10 headworn microphone. 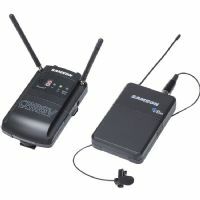 The Stage 212 VHF Wireless System from Samson is a frequency-agile, dual-channel wireless microphone system that provides two handheld dynamic microphones, that transmit to a single rugged metal receiver. 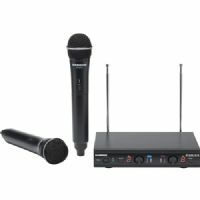 The Samson AirLine 77 AH7 Headset system is a wireless microphone solution designed to meet the specific demands of presenters, singers and other active performers.